James O’Keefe and his colleagues at Project Veritas, an operation known for secretly filming videos of political opponents, which are then heavily edited and presented in dishonest contexts, crashed events hosted by the Democratic Socialists of America in Washington, D.C., where federal administrative employees were present. 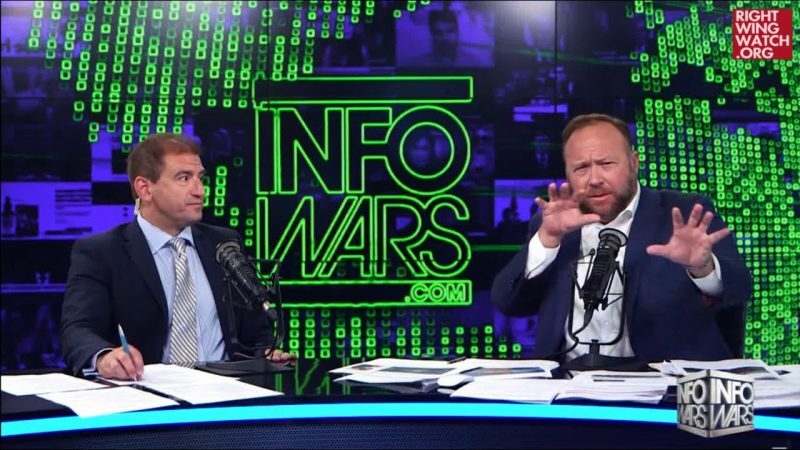 Now, Project Veritas is trying to get those employees fired in order to vindicate the President Trump’s Infowars-esque claims that there is a shadow government out to get him. Anybody with a basic understanding of the DSA and its members understands the preposterousness of O’Keefe’s assertion that a federal employee’s DSA membership is proof of their part in some grandiose conspiracy to undermine America. DSA advocates in its stated mission that United States citizens must be able to have a say on national social and economic decisions, and many of DSA’s core pillars, such as universal healthcare, are overwhelmingly supported by the populace. But DSA, after a recent boom in membership, has faced McCarthy-era characterizations from right-wing media that cast it as a dangerous, radical political movement akin to fascism. 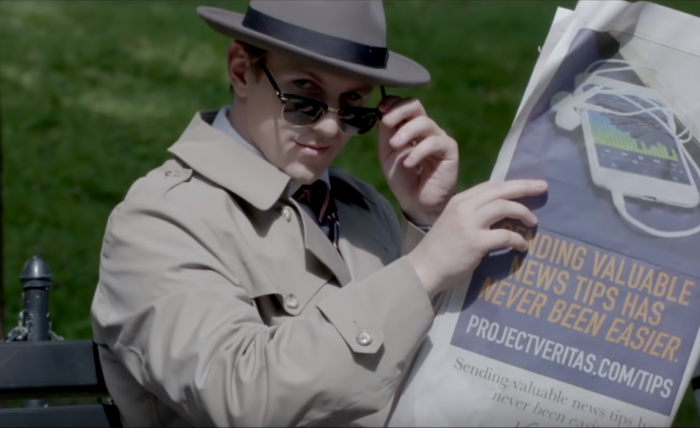 In its latest project, which features a cringe-worthy intro montage featuring O’Keefe in a trench coat while dubstep music plays, Project Veritas claims to be unmasking a supposed “deep state” by publicizing videos of federal employees it filmed at DSA events, and having its lawyers send letters to federal agencies seeking to get those employees fired. But the only thing Project Veritas actually makes clear in its latest batch of videos is that it is totally happy to wreck random people’s lives with half-baked assertions in order to make a buck manufacturing “proof” to support Trump’s conspiracy theories. In the name of “journalism,” O’Keefe once tried to lure a CNN reporter onto a boat loaded filled with dildos. Last year, O’Keefe’s attempt to dupe The Washington Post backfired when actual reporters investigated the fake source he sent to them in an apparent attempt to cast doubt on the story they broke on U.S. Senate candidate Roy Moore’s predatory behavior toward teenage girls. Before that, O’Keefe accidentally left a voicemail on the recording machine of an organization he hoped to sting, laying out his entire plan. The Atlantic writes that James O’Keefe has largely made himself irrelevant in modern politics, but he still raises millions of dollars and is somehow treated as a legitimate source by right-wing news outlets. 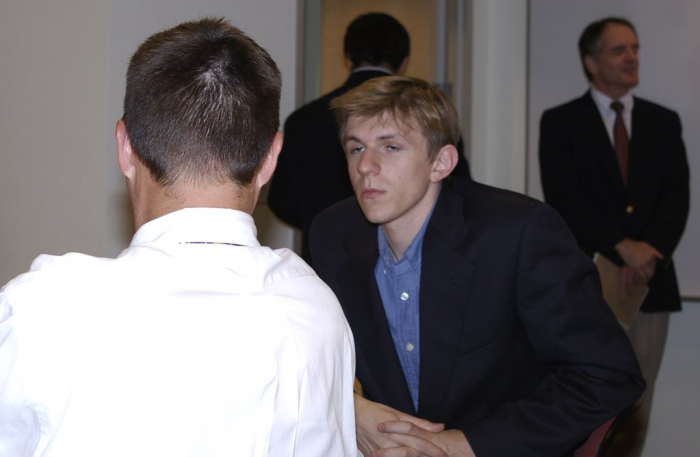 O’Keefe entered the political arena with some questionable ties, having appeared at a white nationalist event in 2006 hosted by longtime white nationalists Marcus Epstein and Jared Taylor. 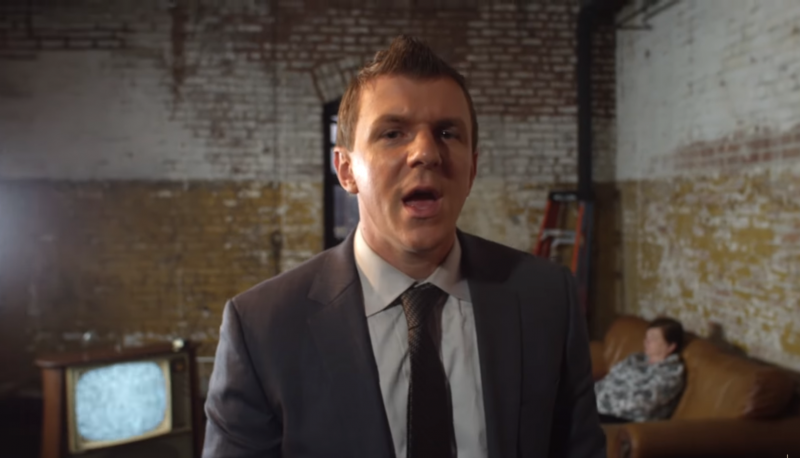 In his organization’s latest stunt, O’Keefe seeks to validate “deep state” conspiracy theories. But If O’Keefe had really wanted to prove that a deep state government exists, he would have aimed higher than random administrative workers attending DSA happy hours and set his sights on top-level officials who actually wield power within the federal government needed to make a “deep state” effective at any non-imaginary scale. Or perhaps he’d take a look at the federal officials being ousted for their ties to violent extremists. But instead, he performed his tired schtick of selling right-wing misinformation that he passes off as ground-breaking journalism. The first video in Project Veritas’ series highlights Stuart Karaffa, a State Department employee who said he works on data analytics. O’Keefe says on video, “Make no mistake, this man is a radical,” while a Russian hammer and sickle is superimposed next to his face. Karaffa told Project Veritas operatives that he used the extra time on the job to draft DSA-related emails and that he would wait until after work hours to send them. When questioned, he said it was nearly “impossible” to fire federal employees. 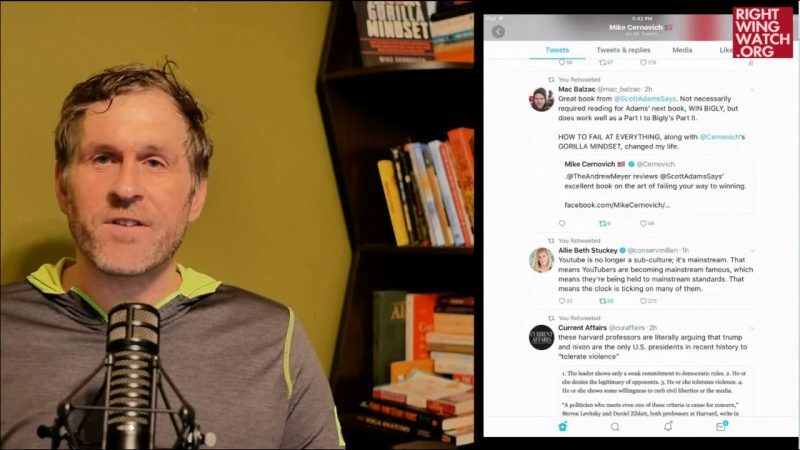 “There you have it … these deep state officials, using the rules of government and lack of civil service reform to subvert the will of the people,” O’Keefe says. Project Veritas lawyer Richard Manning then appears on camera to call for civil service reform to make it easier to fire federal employees. Then, Judicial Watch’s Bill Marshall joins O’Keefe to argue that the Department of State is acting improperly by not firing Karaffa after he disclosed his DSA ties on a finance ethics form. In another Project Veritas video released today, O’Keefe took aim at two other administrative workers who also participate in DSA events. Project Veritas’ latest video shows Allison Hraber, who is a Department of Justice paralegal, and Jessica Schubel, a former Health and Human Services worker. The video highlights Schubel, who tells a story about getting an advance copy of a policy that was planned to be enacted at HHS that she would be then able to share with reporters. O’Keefe claims her story is proof that she is part of the deep state. Footage of Hraber, who was already facing potential discipline for protesting against Homeland Security Secretary Kirstjen Nielsen at a Washington restaurant, was introduced on camera with another hammer-and-sickle overlay. When describing her liberal and socialist co-workers, Hraber uses the phrase “resist from the inside,” which is snipped out of her conversation mid-sentence and juxtaposed with footage of Hraber talking about employee protections at federal agencies. Project Veritas also runs audio of Hraber talking about running license plates to identify car ownership—something that activists can often do without law enforcement involvement—and insinuates that she must have done so while on-the-clock at her DOJ position. “It appears as though [DSA is] using government resources to target private citizens,” O’Keefe says. Another DSA member said he assumed Hrabar used consumer research tools like LexisNexis to find their information, to which O’Keefe responds by asserting that because the service is expensive and that another organization member agreed that it could be possible that Hrabar might have used a DOJ LexisNexis account for DSA work, then Hrabar is surely guilty of a HATCH Act violation. “Not only can she be fired, she should be fired,” Manning tells O’Keefe.